How you manufacture your biologic drug product – the process itself – can protect your protein from aggregation. Here are some major considerations. Using shorter, gentler mixing times. Many proteins are sheer-sensitive. By mixing too fast or too strong, your proteins can collide or brush past each other and produce friction, which can deform the proteins and generate aggregation. Moreover, minimizing mixing time will reduce your proteins’ exposure to potentially destabilizing elements such as steel and air (oxygen). Gentle mixing will also reduce excessive foaming generated by any surfactants added to the mixture, which can trigger aggregation. Controlling order and rate of ingredient additions. How you add ingredients, both protein and excipients (chemicals), can make or break your biologic solution. Because each protein requires its solution to have a particular pH to be “happy,” chemicals that adjust pH levels must be added first, or you risk denaturation. Sometimes an active or inactive ingredient relies on an excipient to be effective. For example, an active ingredient that is prone to oxidation may first require an “oxygen scavenger” to make your solution friendlier so the active ingredient can dissolve without getting harmed. How you add each excipient also matters. Can you add it quickly in large batches to save time? Or must you add it slowly as a fine powder because that chemical doesn’t dissolve well? Of course, what you add, when and how are all interrelated; the challenge is to find the right balance among all your ingredients so one doesn’t adversely affect the other or the solution as a whole. Minimizing wide swings of pH adjustments. Swings in pH levels can easily deform your protein’s structure and is among the biggest issues during compounding. To mitigate potential swings, add pH adjusters slowly, and use low concentrations if possible. Also if possible, choose weaker pH adjusters over stronger acid or bases. Another approach is to try to adjust pH first whenever possible, so your protein will encounter a more homogeneous medium when it hits the compounding vessel, which lessens the stress on the molecule’s structures. Controlling oxygen levels in liquids. Oxygen is a primary threat to proteins. Sparging your solution with nitrogen during the compounding process will displace the oxygen and help prevent oxidation. Nitrogen blanketing carried out through the filling and capping portion of the manufacturing operation might be necessary for some drug products. Controlling solution temperatures. As we discussed in part 1 of this article, temperature swings can provoke proteins to unfold and aggregate. Using a temperature-controlled water jacket on the compounding vessel is the most simple, inexpensive and common way to maintain proper temperature during the compounding process. Controlling sanitation of the aseptic filling suite. If your filling area is treated with vapor hydrogen peroxide (VHP) to decontaminate, perform studies to show that high levels of peroxide do not remain when your drug enters the Restricted Access Barrier System (RABS) to be filled. 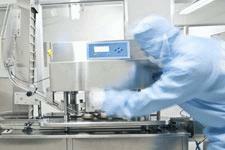 Examine each step along your drug’s manufacturing journey to protect it from potential hazards. Filtration: Using the proper type of membranes (hydrophobic or hydrophilic, depending on the drug product) and flows (screen type) will help keep your formulation intact. They aid in safe passage of your protein solution through the membranes without excessive foaming or adsorption of excipients (such as trapping surfactants), which could modify your final product formulation. Solution paths: Tubing may adsorb formulation components. If even a fraction of critical chemical components of a formulation are removed – such as benzyl alcohol, a microbial agent, or polysorbate, a surfactant – it can impact the drug’s stability, making it more prone to aggregation. Selecting the correct tubing type (material) or filter could prevent adsorption of specific excipients. If that is not possible, reducing flow paths, increasing flow speeds, or flushing the lines after set-up or long line stops are common practices in the industry. Light. If your protein or any component in your formulation is prone to photo-oxidation, you might consider protecting the solution path from light, such as using amber or dim lighting in the filling suite. You could also use shrouded containers, amber vials or secondary opaque containers, which are also common tactics for light-sensitive drugs. High-voltage electrical current (used to detect invisible cracks, leaks or pinholes), which can create ozone, a powerful oxidizer, in the headspace of the container. To ensure your drug gets safely to the shelf, it is important to perform studies of immediate and delayed effects in final containers caused by AVI operation. Since silicone is so problematic yet so necessary in the manufacture of prefilled syringes, take steps when possible to minimize its risk. Use syringes with very low silicone content. Or consider cross-linked (or immobilized) silicone, a relatively new technology: After the silicone is applied inside the syringe, light is used to bond the silicone oil to the walls of the glass barrel, which polymerizes the silicone into a mesh. This treatment adheres the silicone more tightly to the barrel wall and is less likely to be pulled into the biologic solution. Moreover, because the process uses up to 100 times less silicone oil than conventional silicone lubrication, the risk of silicone-protein interaction is inherently reduced. Tungsten is also a powerful destabilizer. Tungsten-free or reduced-tungsten syringes are now available from some syringe manufacturers. Whether to use cross-linked silicone and/or tungsten-free syringes depends mostly on the ability of your protein’s structure to withstand stress. If your biologic is not very silicone or oxygen-sensitive, your risk may be low with a standard syringe. The most critical element of a stable biologic, however, is its formulation. We will examine elements of drug formulation, as well as building stability into a biologic drug via quality by design, in the next installment of this series. In Part 3 of this three-part series, we will examine drug formulation and quality by design. In Part 1, we discussed causes of protein aggregation and the role of stress testing.